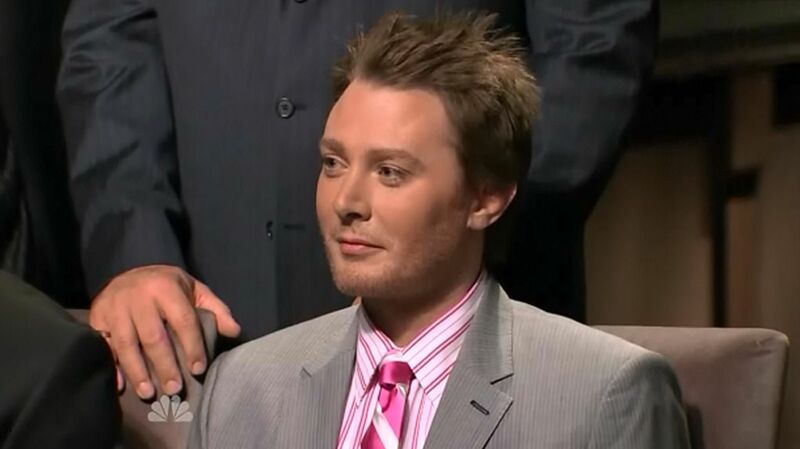 Clay Aiken – Six Million Articles! 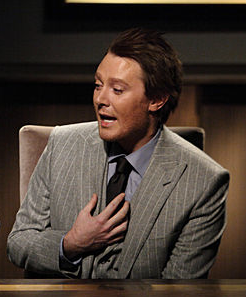 It’s a new week, a new Monday and the name Clay Aiken is all over the news!! According to google, there are almost 6 millions articles that mention Clay! Most of the articles today are about incumbent Republican Renee Ellmers in North Carolina’s Second Congressional District. It seems that Ms. Ellmers had some “interesting” things to say about Mr. Aiken. Ellmers words have been reported in The Daily Beast, The NewsObserver, Politico, and many other news sites. I would imagine Ms. Ellmers has never had so many sites quote her before. She certainly had a lot to say, but, unfortunately, most readers thought she was not appropriate in her comments. Rep. Renee Ellmers (R-N.C.) says she isn’t too impressed by her potential new congressional challenger, former “American Idol” contestant Clay Aiken. In a radio interview with WMAL last week, the congresswoman was asked about Aiken, who is exploring a run in the Democratic primary. …The hosts then asked Ellmers if she had voted for Aiken during his stint on the popular Fox reality show. Yeah. 24 million votes, a huge proportion of them from his home state of North Carolina. She’s in trouble. I say he’s a winner. You know what he did before he tried out for American Idol? He worked with developmentally disabled children. Many with Downs Syndrome. Since my sister has Downs, I say he’s a hero. He continues to give to these causes with his money and time. Also he has had hits on Broadway and has a huge following that fill his concerts. I would say taking her seat would just be one of a long list of accomplishments for such a wonderful young man. Check out his National Inclusion Project. Clay came in second out of 100,000 candidates. I doubt that Ellmers has ever faced such odds and I doubt she’ll even win the GOP primary. This May, in a field of 2 she’ll come in last. Why the disparaging personal remarks, Rep. Ellmers? You only belittle yourself by such tactics. Such tactics are very popular in the TP. But ask Elizabeth Dole how well it worked for her. Here we see the difference between statewide office vs. gerrymandered districts. If you wonder how gerrymandering impacts the civility of politics, you need look no further than Ms. Ellmers’ rhetoric. Um didn’t he get like second place? I’d say thats very pretty darn well. While I certainly don’t see Mr. Aiken as a viable senate candidate (I’ve never heard him express much in the way of politics nor have I heard him talk about his positions etc) I think her assessment of him based solely on his time on TV is rather insulting. The Washington Post also wrote about Ms. Ellmers interview. They also included a fun graph! The Washington Post – Lost your bid to be an ‘American Idol’? Try Congress. It’s easier. …“Apparently his performing career isn’t going so well, and he’s bored,” Ellmers told Washington, D.C. radio station WMAL. To put that comment in perspective, let’s look at it numerically speaking. 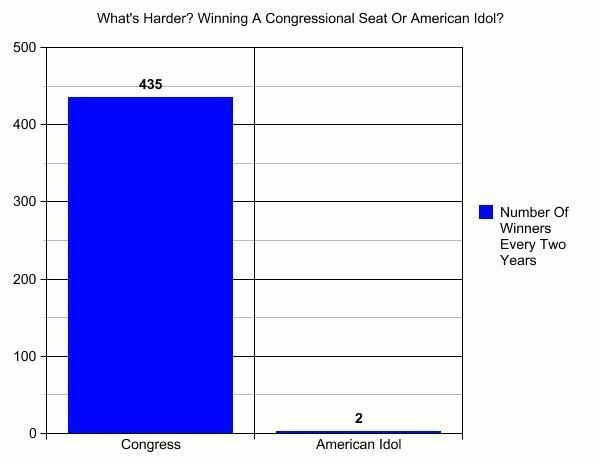 As this incredible chart from ThinkProgress’s Ian Millhiser notes, only two people win “American Idol” every two years — but 435 politicians win election to the House of Representatives. 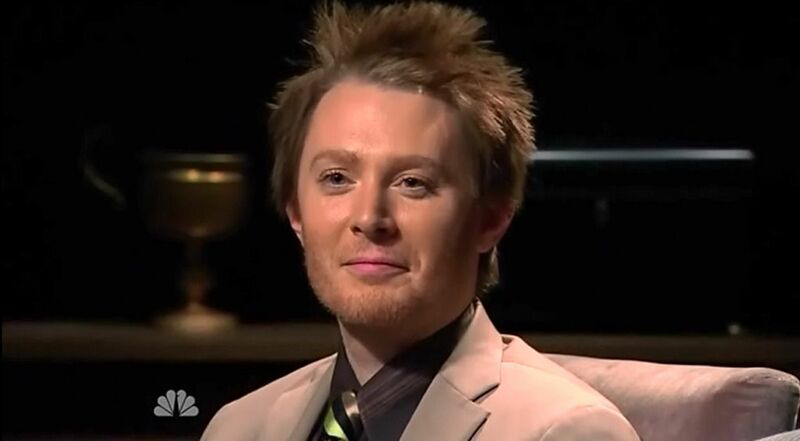 As you can imagine, if or when Clay Aiken announces that he will be running for Congress, there will be many articles about his political goals. Some will be positive and some will be negative. I just hope that people will listen to what Clay has to say and judge him on his political ideas, not on something that has nothing to do with the election. The comments under one of those articles was amazingly positive and very negative to the congresswoman. If you want to call her that, lol. Low blows and she is certainly getting some backlash for it. Can't wait till he announces his candidicy and starts showing how damn smart he is! Clay for Congress!! Ms. Ellmers is not embraced by all Republicans because of her stance on some hot issues. I am a Republican and I wouldn't vote for her either. Not a very classy act. She took some very cheap shots at Clay and that doesn't sit well with me at all. I think on this issue and some others as well, such as attacking Clay without even knowing him, she has a good chance of losing out to him and rightfully so. IMO, she is not a true representative of the GOP, but this is politics….it gets very dirty and people lose their sense of fairness. I just wish Clay all the best in the world on whatever path life leads him. Here's a question- why is she is so nervous about Clay possibly running. There is so much that goes on behind the scenes that I wonder what she knows about his chances to come out this early and start slamming him. He hasn't even officially announced yet! I haven't seen any articles about her saying negative things about the 2 candidates that have officially announced they are running. I enjoyed reading the comments on both articles. They were mostly positive. Mrs. Ellmers made a huge mistake with her disparaging remarks. I retweeted that graph. She is stupid, all she is doing is make everyone defend Clay..He is very intelligent and knows what he is doing, he will have so many people rooting for him she will have no chance. I think if he wants it he will have it, and he will make a great congressman, I wish he was mine….I am willing to give up going to his concerts , to have him do more for people , that is what he wanted to do from day one. The funny thing is he may wind up going even further…….Hey he may sing at the White House..some time. I think Ellmers will be thunderstruck once she sees Clay in action … I think a lot of people will be Impressed (if not surprised). Her comments were pretty ridiculous … they really had nothing to do with politics (not a surprise). I think she is afraid of his popularity. Thanks for putting some of the comments in CANN today musicfan! I can not believe what Renee Elmers said. She does not sound to smart. Clay has not say he is running and she is very negative. In a certain way, I am glad I do not need to hear from her. Good luck to Clay. What interesting remarks, Ms. Ellmers. and such weak criticism. Obviously she hasn't done her homework. Clay's appearance on Face the Nation demonstrated to the general audience that he is very intelligent and knowledgeable about current issues. His appearance on Celebrity Apprentice showed that he is a very capable leader, very focused and organized. Or maybe she does know this and that is worrying her. Error: Error validating access token: Session has expired on Tuesday, 21-Aug-18 16:13:01 PDT. The current time is Sunday, 21-Apr-19 21:34:50 PDT.